The following information comprises planned Media Services, Resources, and Guidelines for Media Interests of the 2019 IHSAA Boys Basketball State Tournament – 3A Sectional #30 Round hosted by Charlestown High School. Charlestown Pirate Pride Booster Club will serve as this tourney site’s Media host; under the direction of Charlestown High School Athletic Director Chad Gilbert and IHSAA Polices and Guidelines for Media Coverage of the 44th Annual Boys Basketball State Tournament, presented by the Indiana Fever & Indiana Pacers. 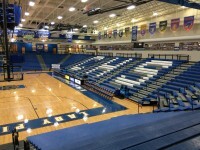 Media hosts will be available in advance of the Class 3A Sectional at Charlestown, as well as throughout the evenings on site; based out of the Media Relations Suite, located at the northeast corner of the CHS Sports Arena. For immediate assistance use either of the above mobile telephone numbers. 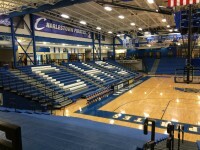 All Media Positions within the Charlestown High School Sports Arena (tourney site) are designated for advance reservation; unless otherwise available for use on a first come first serve basis on event day. During each session of the Sectional tourney, approximately twenty (20) seated Media Positions (tabletop workspace, with chair and 110v electrical outlet) will be available; however, it is strongly encouraged to reserve desired accommodations in advance of the event date. All reserved positions will be labeled according to Approved Media reservations, referring to those who communicate reservation requests in advance. Approved Media should enter the CHS Sports Arena via the Main Entrance, adjacent to the south parking lot (Park Street side of the facility), and observe for the Media Check In window of the arena lobby. Approved Media credentials for the entire day will be available, signature and photo ID required. Assigned Media Tourney Credentials will be issued with a lanyard and are required to be worn visible at all times while inside the venue. Tourney hospitality lounge access vouchers, basic Sectional team information, facility floor plans, and tourney information will be included with Media Credentials, when obtained at the gate upon arrival. The CHS Sports Arena is equipped with two courtesy phone lines that are capable of making a toll free call for radio broadcasting purposes. Confirm requests for available courtesy TX lines, or note the alternate use of a cell phone. Note: If you are assigned to a courtesy TX line, it is possible that its use will be available only for 15 (game clock) minutes prior to game time and 15 (game clock) minutes after game conclusion. AT&T and Verizon cell signals are 4G strength in Charlestown, as an alternative. Additionally, wireless Internet connections will also be available to all approved broadcasting media personnel. Team coaches and players selected by their coaches will be available during designated times for pregame and postgame interviews, in the Media Relations Suite. See schedule provided within Media Credential Packet upon arrival. At no time should a team coach or player be confronted for an interview by the media on the game floor. The Media Relations Suite includes designated table areas for approved media workspace, conducive for laptop and charger device use. Media activities involving photography and broadcasting of live game action may only be performed according to IHSAA rules and/or advance approval where required. CLICK HERE for a complete list of IHSAA Media Rules and Regulations; as post season state tournaments are property and governed exclusively by the Indiana High School Athletic Association. Official tourney game statistics will be made available at half time of each game (for first half interests) in the Media Work Room; and then again after each game in Media Work Room as well as a printable PDF version on the Stats page of this website at www.CharlestownTourney.INFO/Stats. Charlestown High School is newly constructed, completed in 2010 and on the original campus grounds which dates back to the early 1950’s. Charlestown High School is operated by the Greater Clark County School Corporation and has a currently enrollment of approximately 726 students grades 9 through 12. Enrollment of Charlestown High School is comprised of not only residents of the City of Charlestown (8,500+), but also Charlestown Township, Indiana’s second largest in territorial size. Charlestown HS Athletics is a member school of the Mid-Southern Conference as a Class 3A school of the IHSAA, nicknamed the Pirates. The pride of the new Charlestown High School campus is its new 3,200 capacity CHS Sports Arena; featuring “in-the-round-arena-style” seating layout, an adjacent double auxiliary gymnasium and four independent locker rooms.